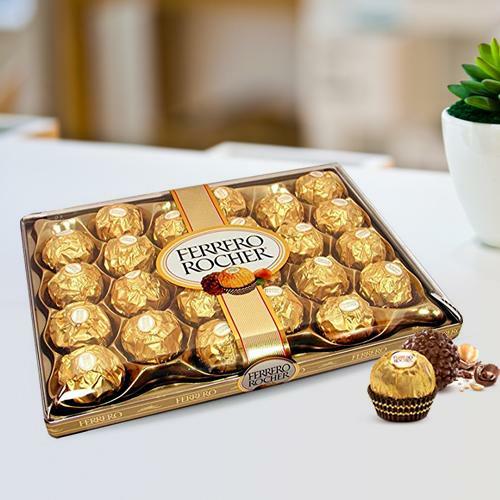 Give your loved ones an extravagant treat by delivering our gift of Two Dozen Ferrero Rocher Chocolates and overwhelm them with its irresistible appeal. The creamy chocolate surrounding a whole hazelnut is held softly within a crispy wafer. These Chocolates create the ultimate delight for any chocolate lover. Deliver this delightful and yummy 4 pcs Ferrero Rocher Chocolate Pack (60 gms) to your near and dear ones. 16 pcs Ferrero Rocher.An ultimate chocolate lovers delight.An irresistable creamy chocolate surrounding a whole hazelnut held softly within a crispy wafer.